In family court cases regarding child support payments, both spouses may be required to complete a report detailing their monthly income and expenses. This article discusses the New Mexico Interim Monthly Income And Expenses Statement to be filed in such cases. This Form 4A-122 is available on the website of the New Mexico Supreme Court. New Mexico Interim Monthly Income And Expenses Statement 4A-122 Step 1: Write the county where your case is being heard and the district number in the top left corner. Write the appropriate names next to "Petitioner" and "Respondent." Indicate which you are by circling the appropriate word in the first paragraph. New Mexico Interim Monthly Income And Expenses Statement 4A-122 Step 2: In section 1, detail both couple's income separately and combined. Enter the total gross income for husband, wife and combined in section 2. New Mexico Interim Monthly Income And Expenses Statement 4A-122 Step 3: Provide the same type of information concerning income deductions in section 3. Total these in section 4 and subtract them from the total listed in section 2. This will produce your net monthly income, which should be entered in section 5. New Mexico Interim Monthly Income And Expenses Statement 4A-122 Step 4: Add your monthly fixed expenses as categorized in section 6, and write the total in section 7. New Mexico Interim Monthly Income And Expenses Statement 4A-122 Step 5: Subtract section 5's values from those in section 7 to produce your net spendable income, which should be entered in section 8. New Mexico Interim Monthly Income And Expenses Statement 4A-122 Step 6: In section 9, write the value of one half of column 3 from section 8. New Mexico Interim Monthly Income And Expenses Statement 4A-122 Step 7: Use the tables and attached sections to complete sections 10 through 12. 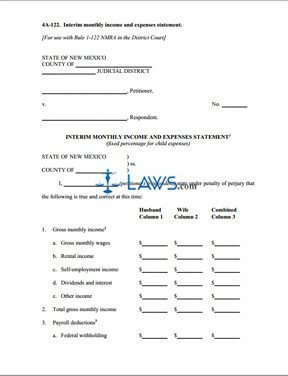 New Mexico Interim Monthly Income And Expenses Statement 4A-122 Step 8: Sign and date the form in front of a notary public.